The green is appearing once again in Minnesota so its time to bring some Spring reading ideas. I’m enjoying a mystery thriller that makes you think of things that go bump in the night and laugh out loud at some at Kathy Reichs’s witticisms in her book “Deja Dead”. I like the audiobook so the narrator Barbara Rosenblat is also a favorite of mine. It’s like listening to a one woman play very well done. If you use Amazon and audible for your audiobook purchases remember to link to Smile.amazon.com where you can pick the charity of your choice while getting much enjoyment from all the products available on Amazon. Take some time today to begin a new book and take an arm chair journey to places near and far. Reading is fundamental to leaning about the world around you and the many personalities all around you. See my whole video blog journey on You Tube #LetsMove for exercise daily since February 24th, 2014. Keep moving everyone. Exercise and eating right, and watching portion sizes works. 3 oz protein and not more than 11 oz total for each of my 3 daily meals works for me. Believe you can make a difference in your life and you will. The picture shows me with my new Spring hair cut (just got one today at boji hairstudio 612.781.1388 in Minneapolis MN) – going to be warmer soon and I’m going to be ready for it. The T-Shirt and necklace I got from TTPBooks.com (Turn the Page Bookstore Cafe). 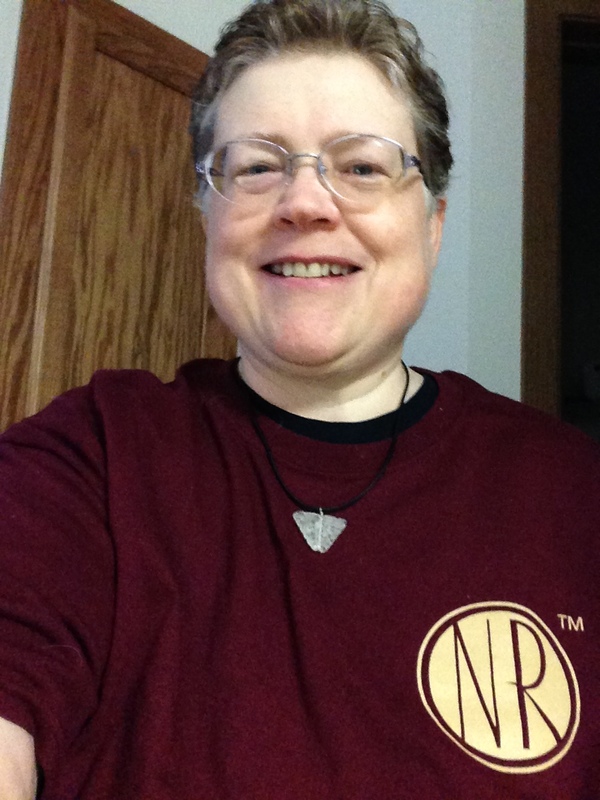 On the back of the shirt is a stack of books – my favorite thing is reading – favorite author symbol NR (for newly released book and Nora Roberts). Wanted to share with fellow bloggers I figured out what “Press This” option means – you can publish a link to that post then introduce it and you have a more recent post. Saves retyping everything when you just want to draw attention to that post at a later date – like event is posted early and then reminder right before the event. Also been learning the rules of the road for Twitter. What fun that has been, while supporting my favorite TV show to date – #WhenCallsTheHeart on @HallmarkChannel. You can get episodes on Amazon, & iTunes if you can’t get the show locally. Otherwise its available On Demand by my cable provider. Tweet with the hash tag tonight to help the #Hearties (#WhenCallsTheHeart fan tag) trend the show. I think this program is special because it shows what it really means to be a person in society, with very little drama and more about living day to day. This show is about a young woman starting at her first teaching position in a coal mining town in the wilds of Canada. I’ve always loved my teachers – school was structured time to learn and grow. My 3rd grade teacher used to read to the class from the book, The Mouse and the Motorcycle, by Beverly Cleary from URL: Mouse and the Motorcycle using Google search on Mouse and the Motorcycle on 3/22/14 at 4:45 p.m. It was the first story I’d really heard at that level read to me. My teacher realized I couldn’t read well when called upon because I was having trouble seeing. This discovery really changed my life – I discovered the world of books and I wasn’t slow just unable to see. The teacher in #WhenCallsTheHeart reminds me of my 3rd grade teacher in how much she cares about each of her students. When Calls The Heart, a Hallmark Channel original series airing tonight at 9/8 Central time see this link for more information on the show: When Calls the Heart , portrays the inner beauty of a teacher that cares for all her students. The writing, costumes and sets/scenery on this show are truly magnificent to experience. So I ask you to tune in and show your support on Facebook, twitter, whatever way you share what you like with social media. Watch and decide for yourself. Here’s some of the cool things I’ve learned about twitter in my pursuit of supporting #WhenCallsTheHeart. 1. Followers are not your goal – the goal of twitter is to give you information that’s of interest to you. If you have something to share – great – but the real purpose is to find out things you didn’t know before or might never have found without tweets on the subject. 2. Twitter jail is a real thing – if you follow too many, or tweet too fast or with the same thing over and over you may be mistaken for spam – so you are suspended from using your account. You can see tweets but are unable to tweet. Twitter has specific guidelines on how to avoid tweet jail here: Twitter Jail rules – well worth the read – helps me decide on what I want to do with my account. Remember RT count in the number of tweets you’ve done for the day so RT wisely. 3. Keep following to those you will be conversing with or direct messaging (DM). I also follow public interest sites such as @letsmove or ‏@JohnEMichel check them out for some good motivational information. 6. What you post on twitter doesn’t stay on twitter – I’ve found old profiles perfectly preserved on the internet. I’m so glad the words aren’t something I’ll ever regret – keep this in mind when sharing on any social media platform. 7.Twitter has helped me cut out extras in my writing. You really have to say what you mean on twitter or you will run out of room, so think through what you want to communicate and keep it simple. Hope all of you will check out twitter and see what potential you might find using that service. Everyone is welcome to comment on this article and give your tips or correct me where ever I may have gone wrong.